Still plugging away looking at the representation of people of color on book covers over the past decade or two. It’s been a little tricky to identify them, but I’ve settled on a strategy. 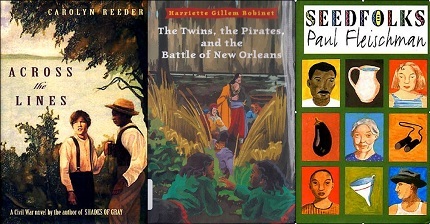 I looked up racial identifiers in the Library of Congress database like, in this case, “African Americans–Fiction.” And then I looked for the book covers for those titles. I counted how many titles were assigned that heading as one of the subjects, by year. 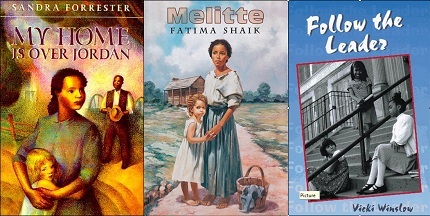 The highest number of hits on the LC subject headings for children “African Americans–Fiction” was in 1997 – more than any year before or since. Most of them were picture books. What follows is a collection of middle and high school level books from this category. My next post will be a similar collection for 2010. Can putting them all together like this help to formulate an idea of how things have changed or stayed the same? This entry was posted on September 13, 2010 at 11:13 pm and is filed under Uncategorized. You can follow any responses to this entry through the RSS 2.0 feed. You can leave a response, or trackback from your own site. Maybe you could make a chart. Everything falls into reason and logic with charts. It’s like a law of nature or something. it’s interesting that a lot of those covers seem to take place in slave days. I wonder if the ratio of that type of story will be same when you post the covers from 2010 and if most of the books with Blacks as the main characters will still seem to have race and culture issues at the center of the story? I’m also wondering (and this may be veering slightly off topic) if a book isn’t specifically about race, would the race of the minority protagonist be represented on the cover? Or listed as “African-American fiction” even? Seems like it would be, but then again… What about a non-race-main-issue book by a white author about a Black protagonist (like Liar)? Would that book come up in a Library of Congress search under “African-American fiction”? And I guess since I’m on a roll I’ll ask, what about stuff that isn’t represented? Have you ever done a comparison of how many books are out there about minorities and how many actually have that represented on their covers? But then you’d have to compare that to how many of the books with white protagonists have their race represented on the cover, huh? That sounds like a lot of work. Exhausted thinking about it. 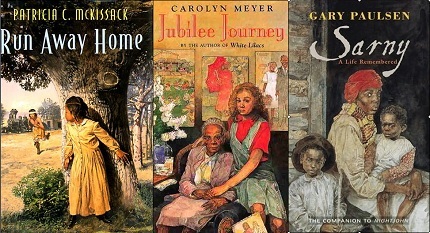 Oh, just thought of an example of the non-race-issue book by white author with Black protagonist thing for 1997. Animorphs. Each cover featured one of the main characters on a rotating basis. One of those characters was Black. She was on at least one cover that year. I can see why that wouldn’t be listed as “African American” if the Library of Congress labels things more according to issues than who the characters are. Gosh, this comment got long. Sorry, to be all with the questions and stuff. Your posts give me stuff to think about. I look forward to seeing the 2010 covers. Thanks for your hard work. I’m finding all your research very interesting. Are you doing this with other races too? Side note: I remember reading Dear America. Those were some good books! I’m pretty sure that the cover of Forged by Fire by Sharon Draper shown here is not the original cover. (It continues to be popular with readers and has had at least three different covers.) I looked it up on Goodreads and there’s one cover, with the title on a vertical blue stripe, that I suspect is the original. It’s much more like the other 1997 covers shown here. This batch is dominated by historical fiction; Forged by Fire is an exception.